Other than the fact that Ferrari's Enzo successor, the F150, will be stealing a name from America's best selling truck, we could only speculate about what would be under the carbon fiber body. Now we have a better idea. At a not-so-top secret viewing in Maranello, potential customers apparently got the skinny on the new ultra-Ferrari's performance stats. 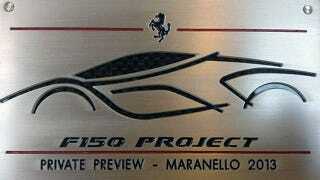 This is what those customers learned about the fastest roadgoing Ferrari to ever come out of Maranello. It starts with a rumored power figure of 800 horsepower with the V12 revving to a manic 9200 rpm. Then we add another 150 from the KERS system for good measure. That's right, a whopping 950 horses under your right foot, with maximum torque also available from 1000 rpm. The F150 will be an alleged featherweight at 2800 pounds — that's what a Subaru BRZ/Scion FR-S weighs — and will reach 60 mph in 3.0 seconds followed by 120 mph after just 4.0 more trick. From that speed, it will come to a full stop in 377 feet thanks to simply massive carbon brakes. Top speed is said to be 230 mph, while the Fiorano test track was covered in 1:20 by Fernando Alonso behind the wheel. That is 3 seconds faster than what an F12berlinetta can achieve. Of course, the F12berlinetta was already the fastest roadgoing Ferrari to ever go around Fiorano. Three seconds faster on a short track like that is huge. Ferrari got greedy after the success of the Enzo, so insiders are saying they will make 499 F150s, compared to 399 for its forefather. Three colors will be available (we're guessing the traditional trio of Rosso Corsa, Giallo Modena and Nero), with a list price of a cool €1.2 million, which is $1.62 million American. It seems the McLaren P1 will have a bit of competition from Italy. Go grab your credit cards, there's a pretty massive queue already.